326 pages | 43 B/W Illus. Making space for imagination can shift research and community planning from a reflective stance to a "future forming" orientation and practice. Cultural mapping is an emerging discourse of collaborative, community-based inquiry and advocacy. This book looks at artistic approaches to cultural mapping, focusing on imaginative cartography. It emphasizes the importance of creative process that engages with the "felt sense" of community experiences, an element often missing from conventional mapping practices. 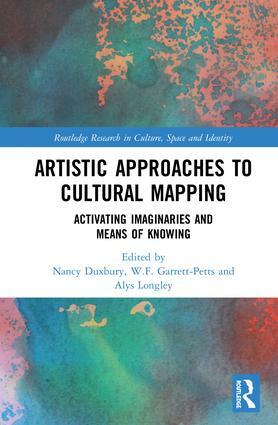 International artistic contributions in this book reveal the creative research practices and languages of artists, a prerequisite to understanding the multi-modal interface of cultural mapping. The book examines how contemporary artistic approaches can challenge conventional asset mapping by animating and honouring the local, giving voice and definition to the vernacular, or recognizing the notion of place as inhabited by story and history. It explores the processes of seeing and listening and the importance of the aesthetic as a key component of community self-expression and self-representation. Innovative contributions in this book champion inclusion and experimentation, expose unacknowledged power relations, and catalyze identity formation, through multiple modes of artistic representation and performance. It will be a valuable resource for individuals involved with creative research methods, performance, and cultural mapping as well as social and urban planning. Nancy Duxbury, PhD, is a Senior Researcher and Co-coordinator of the Cities, Cultures and Architecture Research Group at the Centre for Social Studies, University of Coimbra, Portugal. Her research examines culture-based development models in smaller communities, cultural planning, cultural mapping, and creative tourism for local sustainable development. Recent books include Animation of Public Space through the Arts: Toward More Sustainable Communities; Cultural Mapping as Cultural Inquiry; Culture and Sustainability in European Cities: Imagining Europolis; and Cultural Policies for Sustainable Development. W. F. Garrett-Petts is Professor and Associate Vice-President of Research and Graduate Studies at Thompson Rivers University, Canada. His recent books include Cultural Mapping as Cultural Inquiry (2015); Whose Culture is it, Anyway? Community Engagement in Small Cities (2014); and PhotoGraphic Encounters: The Edges and Edginess of Reading Prose Pictures and Visual Fictions (2000). He is currently engaged in exploring questions of visual and verbal culture, cultural and vernacular mapping, and the artistic animation of small cities. Alys Longley is an interdisciplinary artist, writer and teacher. Alys's books include The Foreign Language of Motion (2014)and Radio Strainer (2016). Alys is a Senior Lecturer in Dance Studies, University of Auckland, New Zealand. The Routledge Research in Culture, Space and Identity Series offers a forum for original and innovative research within cultural geography and connected fields. Titles within the series are empirically and theoretically informed and explore a range of dynamic and captivating topics. This series provides a forum for cutting edge research and new theoretical perspectives that reflect the wealth of research currently being undertaken. This series is aimed at upper-level undergraduates, research students and academics, appealing to geographers as well as the broader social sciences, arts and humanities.